Intel’s upcoming 22nm Ivy Bridge ULV (Ultra Low Voltage) processors have been detailed by Vr-zone. 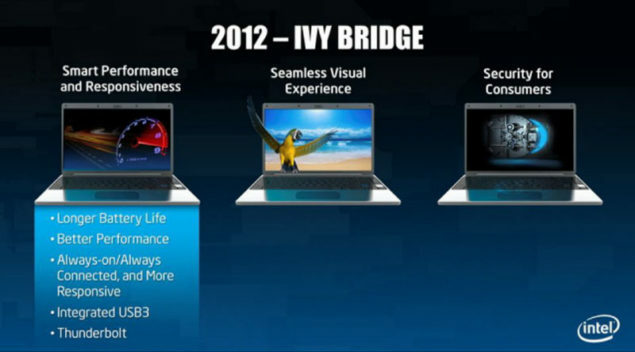 The Ivy bridge based ULV processors would be part of Intel’s mobile arsenal which would launch during the end of Q2 2012, The Desktop lineup would arrive early in April. The new Core i7/i5 Ivy Bridge ULV processors would feature a programmable TDP (Not supported on all CPU’s) which would allow the processor to turn up/down the TDP to increase the clock frequency. Processors supporting this new feature include the Core i7-3667U which runs at a stock speed of 2GHz at 17W TDP and 2.5GHz at a 25W TDP while the Core i5-3427U operates at stock 1.8GHz (17W) going down to 14W at 800Mhz and operating as high till 2.3Ghz at 25W without turbo mode. At the bottom of the lineup lies the Core i3-3217U which operates at 1.8Ghz, TDP can’t go higher tough it could be reduced to 14W at an operating frequency of 800Mhz. The processors lacks turbo boost and features a weaker graphics core running at 1050Mhz instead of 1150Mhz. It does retain a 3Mb L3 cache and native support for DDR3-1600Mhz memory. Other Core i5 series processors include the Core i5-3317U (1.7Ghz) which can be toned down to 800Mhz at 14W TDP. The turbo boost ranges from 2.4Ghz with two cores and 2.6Ghz with single core operational. The graphics core runs at the same clock speed of the Core i3-3217U at 1050Mhz however the chip is unlocked which could allow for overclocking on the GPU core, Its upto the manufacture if the add support to do that for users. Last up is the Core i7-3517U which runs at 1.9Ghz, A 25W TDP allows the CPU to run at 2.4Ghz and going as far as 2.8Ghz (two cores) and 3.0Ghz with one functional core. The processor would feature a 4Mb L3 Cache and the GPU runs at 1150Mhz.